Microsoft yesterday announced that the company closed the acquisition of Skype which is now an official part of Microsoft Corp. The acquisition, which cost Microsoft $8.5 billion US Dollars was originally announced on May 10, 2011. Former Skype CEO Tony Bates is the first president of Microsoft's Skype division reporting directly to Microsoft CEO Steve Ballmer. Skype offices and employees will stay in their original locations, so no change there either. Skype users will be glad to hear that the products offered by Skype will remain as they are for the time being. Microsoft has plans however to integrate the technologies of the voice over IP software into other Microsoft products to increase Skype's range and profits. Microsoft has set up a Skype portal on the microsoft.com domain which currently redirects all links to the official Skype website. How will Microsoft manage to get a return on their investment? It is likely that we will see integration of Skype into core Microsoft products. Possibilities include Microsoft Windows, Office, Xbox Live and the web products like Hotmail and Windows Live in general. The goal to reach 1 billion users daily would mean that Microsoft would have to integrate Skype into nearly every Microsoft product available. Even then it is a very ambitious goal. Skype recently struck a deal with Facebook to integrate the company's video calling technologies into the social networking site to allow Facebook users to make video calls on the site. Microsoft could be thinking of similar options for their online products. Probably the most interesting question at this point in time is if Microsoft will integrate Skype into the upcoming Windows 8 operating system. Doing so would boost the market reach of Skype significantly. Considering that Windows 8 will be optimized for tablets it could very well give Microsoft a much needed boost in that market. What's your take on the Microsoft Skype acquisition? Will we see Skype integrated in all Microsoft products in the next twelve or so months? why do i have the feeling that skype is now about to get permanently screwed up? maybe it’s those two words “integrate” and “microsoft” that usually result in foul language by end users. Underline on “….or the time being”. 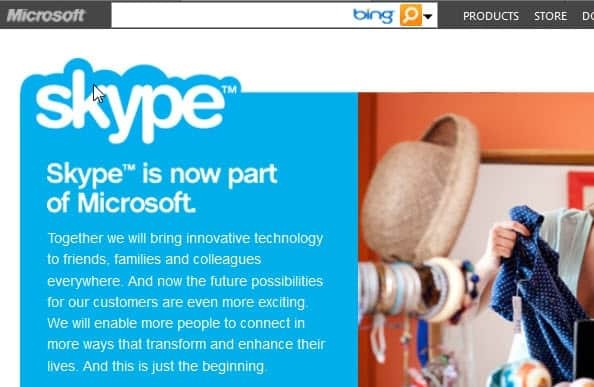 Add the $8,5B, in cash, for Skype, to Bing’s $9B losses.